So this week I'm up to my ears studying law. Every now and then our lives go in funny directions, so I'm reading up on law. I can't really say any more than that, but it's a good thing, not preparation for a trial. Rewriting has been going well, although I find myself constantly circling back around to polish up earlier chapters, which I usually forbid. I keep polishing up because I realize that I can leak little hints about what's coming so the flow seems a little bit more like a freeway and a little less like a road with poorly timed stop lights. Go home stop light, you're drunk. 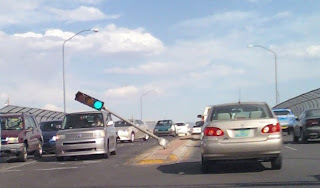 Yes, that's my picture, I was driving past when I saw the wind had knocked a stoplight into that car. In Albuquerque, Light Stops you. No, I didn't realize it was filled with typos. But then I can't read legalese, so I'd not notice the typos! Love the picture. I'd love to start taking more shots...then I wouldn't always worry about finding free photos on the net! Great photo, although not so great for the driver of that car! Interesting. Good luck with this new endeavor! Some writers will tell you not to go back, but in my opinion, going back and adding those earlier details is a powerful strategy. Probably a quarter of my story was written that way. That picture is great, but it's the caption that really cracks me up! I can't (shouldn't and must resist the impulse to) go back and rewrite earlier chapters in first draft. I have to get to the end to know what the beginning needs. That's just me though. Since you're rewriting, I think you're going to do great with it. and i love hints, been backtracking or at least jotting that stuff down to sprinkle in later. hilarious caption! a true, $#*+ happens moment!